Quoting a line from Crank, probably isn’t the best way to begin a review, but as far as Party Crashers goes, the line definitely feels relevant! From the same developers that gave us Party Golf last October, the Giant Margarita developed Party Crashers is a game worth talking about. It might not have the charm of Super Mario Party or be as great of a racer as Mario Kart 8 Deluxe is, but let’s not write Party Crashers off just yet. After all, this is one budget party game that comes packed. Whether you will get on with all of them or not, across 4 main game modes (Elimination, Race, Time Trial and Battle,) Party Crashers is a party “battle racing” game that has more than 40 game modes. Only, like with Super Mario Party, the entire game is not available to you from the get-go, since when you first boot up Party Crashers, the Game Modes option is denied to you. By accepting, the keys to the kingdom will be yours, but there is a reason why the modes are restricted in the first place and that’s so that new players can get used to the premise and initial gameplay before getting flooded with choice. So, although the option is there for anyone to take advantage of, it is actually there for those who have played the game already. Having avoided the game until I played this month, the actual handling of the vehicles took some getting used to, especially since I steered off the track plenty of times during Elimination, but once you do reach that point where you, the controls and the handling click into place, the real fun can begin. One such way players can have fun, other than actually playing one of the game’s many modes, is by first customising the vehicle they wish to use. From golf carts to a bananamobile, there is a bit of a selection. You can even set your desired horn sound from those available, as well as decide on what hat you want and the colour you wish your vehicle to be. While some who play Party Crashers might feel there isn’t enough variety with regards to the customisations, there is still a plentiful amount and if I’m honest, if we did have more choice, it would mean when playing with others, you will have to wait longer until you can actually start playing. Now, although I will not go completely into detail with regards to all the game modes available, what I shall do, is break down the 4 main modes, which are made up of others. In Elimination, the main principle is to avoid dying and being eliminated, in a series of rounds. At the end of each round, points are awarded and based on where you come, with bonus points for killing available. Some of the modes you can expect to have fun with when doing Elimination, include: One Lap Dash, Trailer Trash, Et Tu Brickus and Ice Ice Bouncy. Prior to setting off you can also set handicaps and decide on mutators, such as power-ups, afterdeath effects, collisions and all that jazz. Although, mutators are not just limited to Elimination, as it’s available for every mode belonging to the four main ones. The second main mode is Race, which should be self-explanatory, but essentially it’s a series of rounds consisting of races and a few of its choice modes are: Super Classic Arcade, Don’t Wipe Out, Speed Racer and Trailer Trash. After Race, is Time Trial, a fun mode all about speed, coming first and features modes such as: Deadly Walls, Jumps, Slippery Track and No Collisions. As for the last mode, well, that one is called Battle and it is exactly as it sounds. Whether playing against the AI or your friends, with Battle the time to blow each other to hell has arrived and it features such modes as: Rocket Party, Guns, Coin Chase, 5-Minute Match and Surround. Other than Battle being a series of modes that help Battle live up to its name, with Battle and its 10 modes, instead of the tracks consisting of the 9 that are available in the other modes, players can decide between a square-shaped and a circular-shaped battlefield. But essentially, no matter what your poison may be, in my opinion, Party Crashers does have something to offer everyone. It is a game you can play on the go and it performs quite well, with no apparent issues. 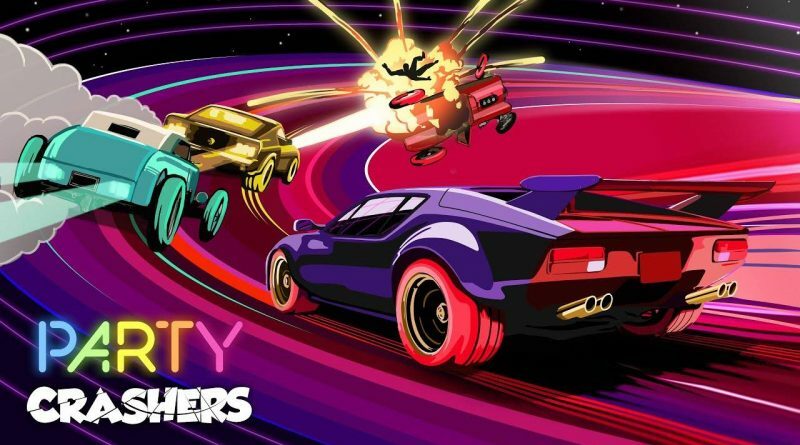 If you want variety, multiplayer silliness that you can jump into and a game where ramming each other off the road isn’t just something available to you, but actually encouraged, then you might just find a gem of a game with Party Crashers. It is best played with friends, but even when playing on your own, you can still get something out of the experience. Sure, it’s not a must-buy, but for those who do opt to purchase it, it is a must-play game, and not one of those games we all buy on a whim, only to never play it.